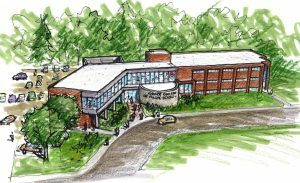 An open house and dedication ceremony of the newly completed, $8.5 million Dr. Dane A. Miller Science Complex on the campus of Grace College, Winona Lake, Ind., will be held from 3:30 – 5:30 p.m., Friday, Oct. 5. The complex, named in memory of co-founder and former CEO of Biomet Dane Miller, is a feature project of the Aspire Campaign for the school. The dedication ceremony will begin at 4:45 p.m. and is expected to last approximately 15 minutes. Participating in the dedication will be Grace College President Dr. Bill Katip; Grace College Vice President of Advancement Dr. Drew Flamm; Executive Vice President and CFO of Zimmer Biomet Dan Florin; President and CEO of K21 Health Foundation Rich Haddad; Mary Louise Miller, widow of Dr. Miller; and other community leaders. The Science Complex is most easily accessible via Wooster Road. Parking will be available in the Science Complex lot just north of the building, at McClain Hall just east of the Science Complex, and at the MOCC across Wooster Road.